Pompous Albert was adopted by Mike and Susan Singleton and became the resident office cat at their local business office in Salt Lake City, Utah. 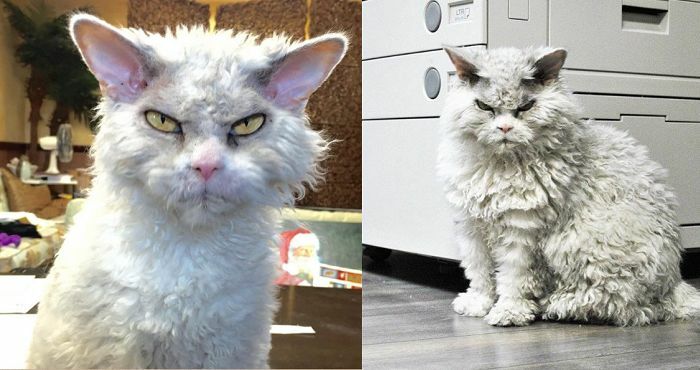 They thought his his curly, white-grey curly hair resembled that of famous scientist Albert Einstein, and at one point decided to share his grumpy face with the world, via Instagram. It’s a good thing too, otherwise we would have all missed out on one of the grumpiest-looking creatures to ever walk the Earth. Pompous Albert’s bio reads “Rejected show cat, but I’ll show them”, and boy did he ever stay true to his word. The people who rejected him must be scratching their eyes out seeing how far he’s come. While the permanent angry look on Pompous Albert’s face is the main draw for most of his fans, it’s not the only thing that keeps people coming back for more. His owners also caption each photo and video they upload with sarcastic comments that fit his look perfectly. For example, one photo where he stares angrily into the camera is captioned with “Albert’s Office Tip: This is the look you give a boss who wants you to work over the weekend,” while another reads “Let’s assume I’m right, It’ll save time”. For more of Pompous Albert’s irresistible angry face, check out his popular Instgram page. Oh, and also read this article by Sage Singleton, one of Albert’s human sister, about growing up in the shadow of a famous cat.